On January 24, at Naha Airport, people from the various hosting communities and those involved in tourism welcomed the members of the professional baseball teams who arrived for training camps. On January 24, at Naha Airport, an event organized by the Okinawa Convention and Visitors Bureau and the Okinawa Sports Convention Promotion Association to welcome professional baseball teams to Okinawa was held ahead of their training camps. This year nine Japanese and six Korean teams will hold their training camps in Okinawa. The total of 15 teams is the largest number to date. 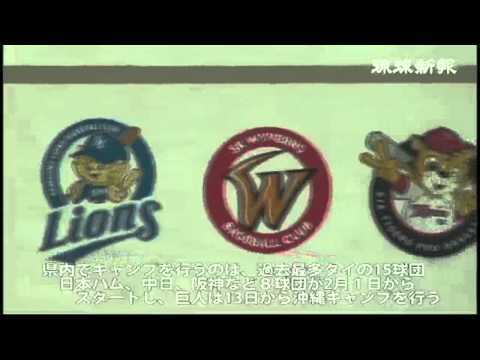 Eight teams, including the Hokkaido Nippon-Ham Fighters, the Chunichi Dragons and the Hanshin Tigers will begin their camps from February 2. The Yomiuri Giants start from February 13. The Hiroshima Toyo Carps usually hold their camp in Okinawa City, but this year they will hold it in Miyazaki Prefecture because the Municipal Baseball Stadium is closed for renovations. With regard to the Korean clubs, the Hanwha Eagles start from February 20, and other clubs will come from mid-February. At the Welcome Hall on the second floor of Naha Airport, about 200 people from the various hosting communities and those involved in tourism gathered for the ceremony. Buses that will carry people around the various camps of the Japanese teams were also exhibited at the event. During the February period of the professional baseball camp season, on weekdays six buses will operate and seven on weekends and holidays. The prices are 1000 yen for adults and 500 yen for children, and this allows unlimited rides that day.